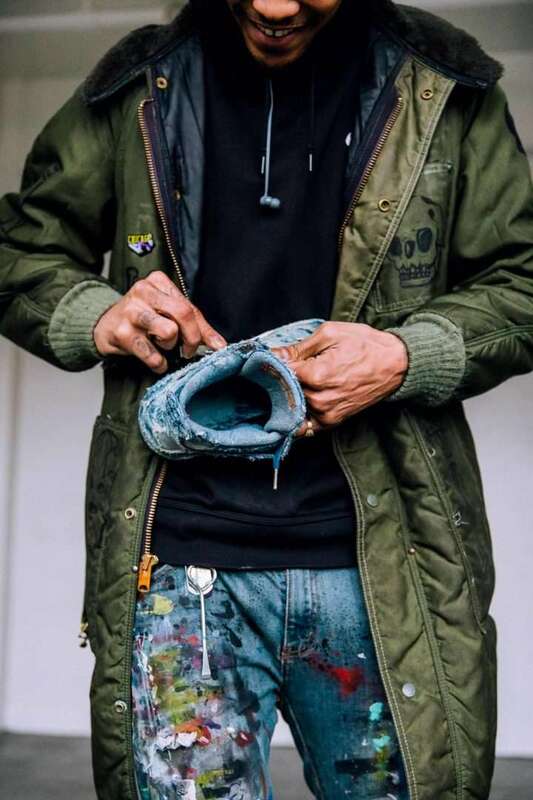 Artist Julian Gaines applies his hand to many canvases – from painting, to customizing clothing, to tattooing friends. 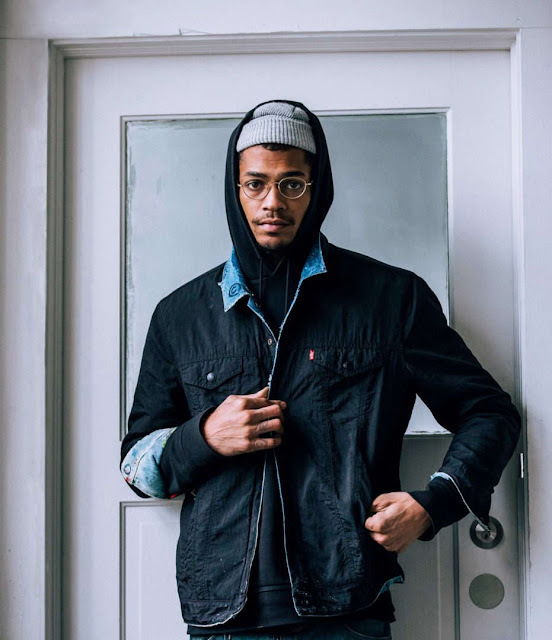 At 26 years old, Gaines already has numerous collaborations under his belt and his work can be seen on the backs of the many cultural luminaries who have commissioned his work on their clothing. 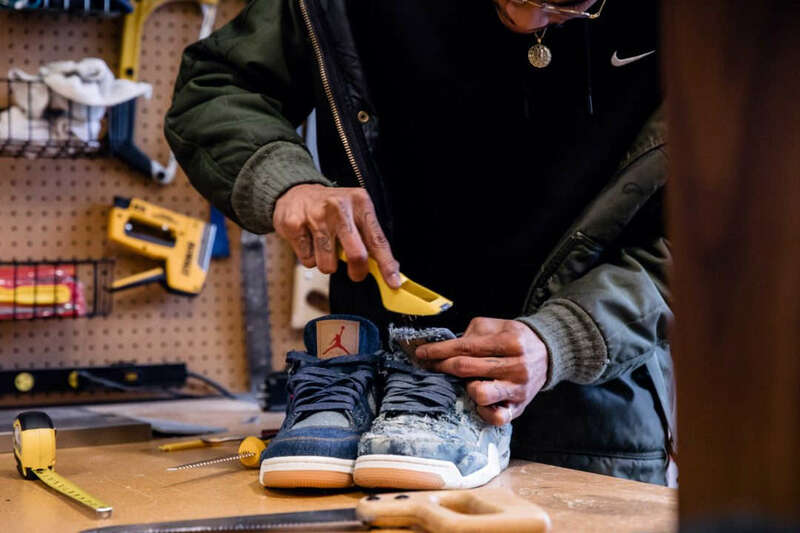 To mark the launch of the Jordan X Levi’s® collaboration, we approached Gaines to transform the AJ 4 and a reversible denim jacket in the pack. 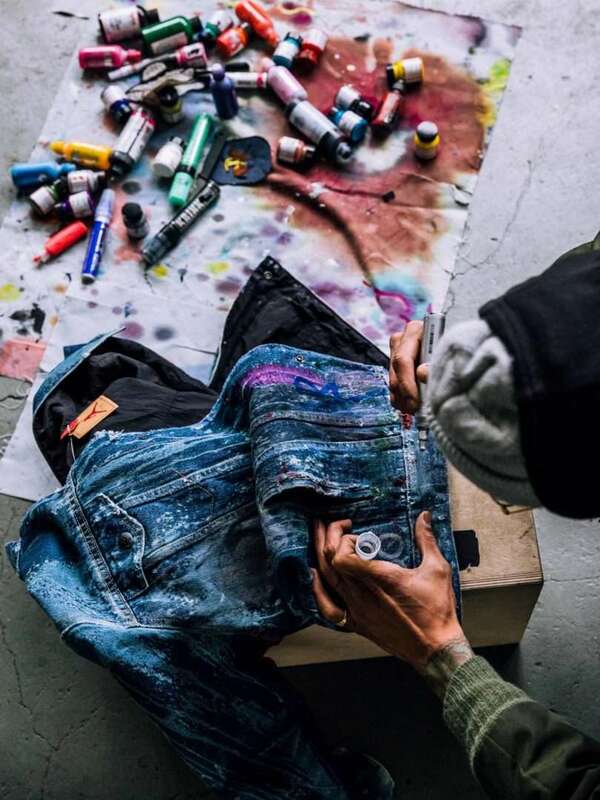 Below, Gaines explains his creative approach to the project and why denim is a canvas he literally lives in. Tell us about your connection to Jordan. I was born on Jordan day. October 18th, 1991. Michael Jordan is the greatest. He represents the epitome of Chicago. The goosebumps I get watching him on VHS, and knowing what he did for my city to even have that impact. I only pray that artistically I can do something that’s somewhere close. 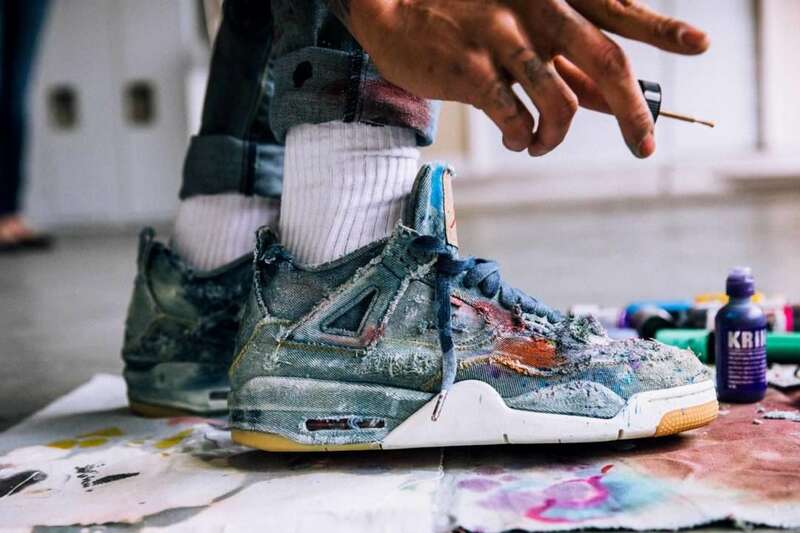 How did you first start creating art on J’s? Growing up, I had an affinity for Jordans and Air Force Ones, but my mom knew I was going to be tall, so she’s like ‘I’m not going to buy you a whole bunch of shoes when you’re going to outgrow them’. Kids can be mean: ‘Your shoes are bummy, is your mom going to buy you a brand new pair?’ Just so that wouldn’t happen, I would create. I would paint and draw on them. If I can’t get the brand new joints, mine would be brand new creatively. I’ll be the only one with these. It made me resourceful. You don’t have to have the best of things but you should make the best of what you have. 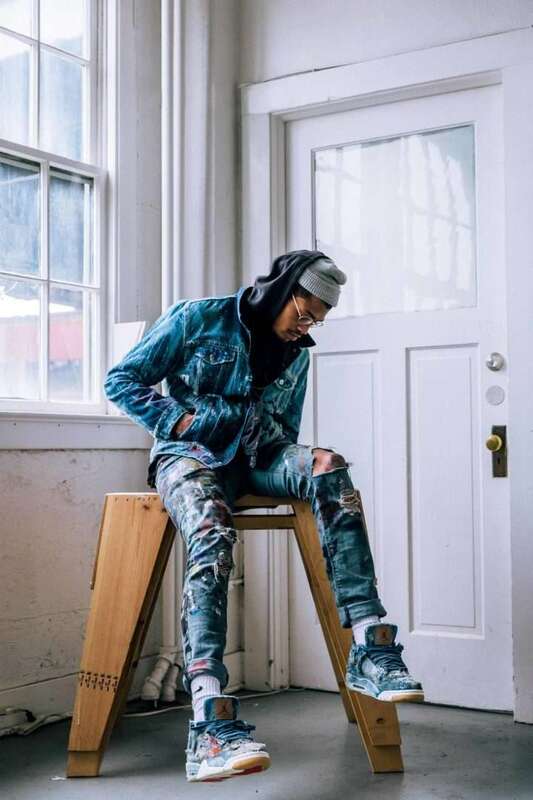 How is it painting on denim vs painting on canvas? It’s very different. I’ve been painting on denim for almost 10 years now and denim is more challenging. 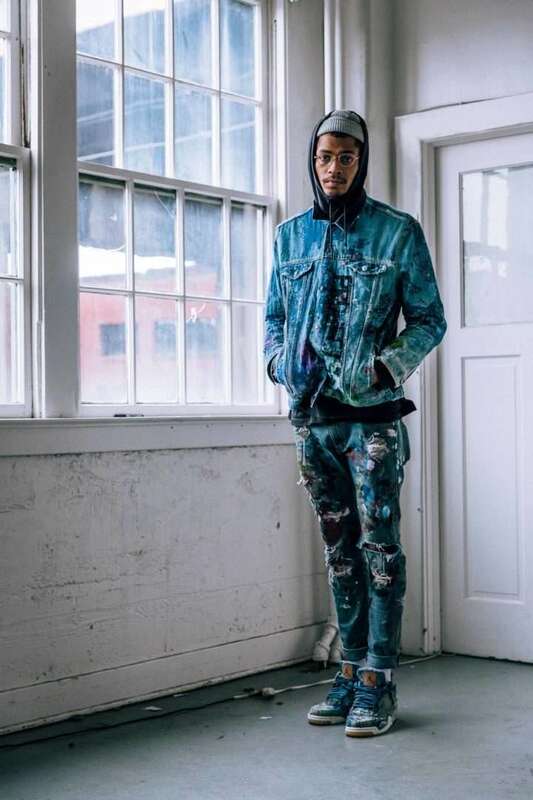 From high school throughout college I continued to explore painting, printing and distressing techniques on denim clothing, turning them into functional fine art pieces. Painting is all I’ve ever wanted to do. I have a Bachelor’s Degree in drawing and painting and clothing allows one to have functionality with the art. You can’t take your favorite painting, which might be on a wall, and put that on your body, and go to the club. You can’t take a Rembrandt and lay it on yourself. That’s why I gravitate to clothing a lot, even though my heart is in painting canvases. 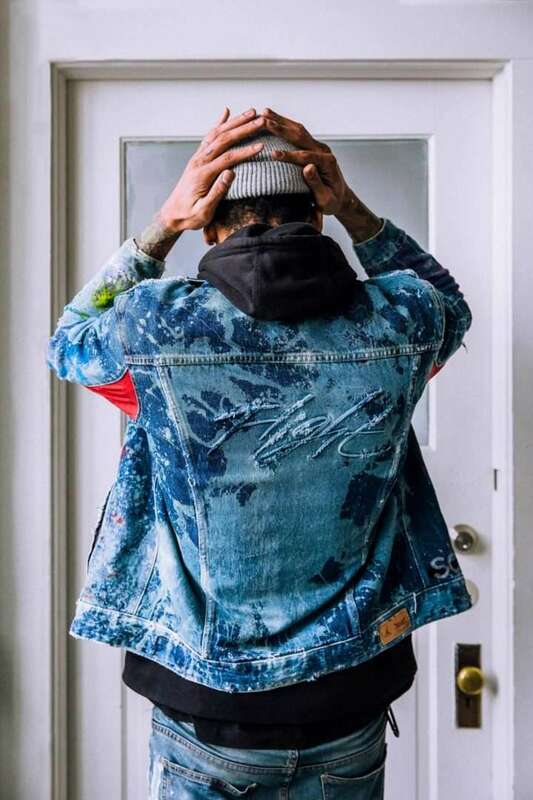 The denim on the 4s and this jacket is really receptive to the ink, and it only gets better after a few wears. This denim was a great canvas; its durability allowed me to heavily distress the 4s, aging them about 30 years! If denim is your canvas, I guess you can never wash your jeans! I started hand washing my jeans after having three dogs in college. I was like ‘Okay, the freezer’s not going to kill the dog smell. I’ve got to wash the jeans.’ But I was a little despondent about it. It’s an emotional time when you’ve got to wash your denim; these days I use my jeans as my paint palette. So much nostalgia that you’re risking. 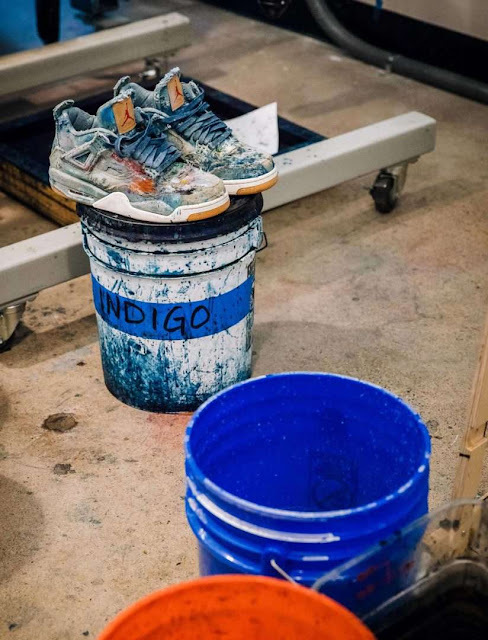 You were saying earlier the best thing about working with Jordan is not just working with the product, but the connection to the knowledge base at the brand. Yeah, it’s the creative community I value the most. I love being able to hit friends like Gemo [Wong] and be like, ‘Yo, G, do you like this project? Is this wack? Is this real news?’ Quality friendships are essential. And my friends genuinely give me good feedback; they really care about what I’m creating. I listen to my big homies. It’s really easy to say that you listen, but I really listen and implement what they’re saying into my game. And if they say, ‘Do it’, Imma do it. Art is subjective. I find value in the hard critics. Constructive criticism doesn’t deter me. It adds oxygen to my creative fire. I have a competitive mindset with art and design. 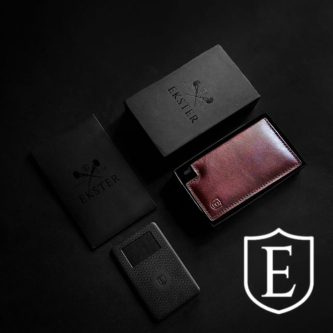 When I design, I want my stuff to be the best. 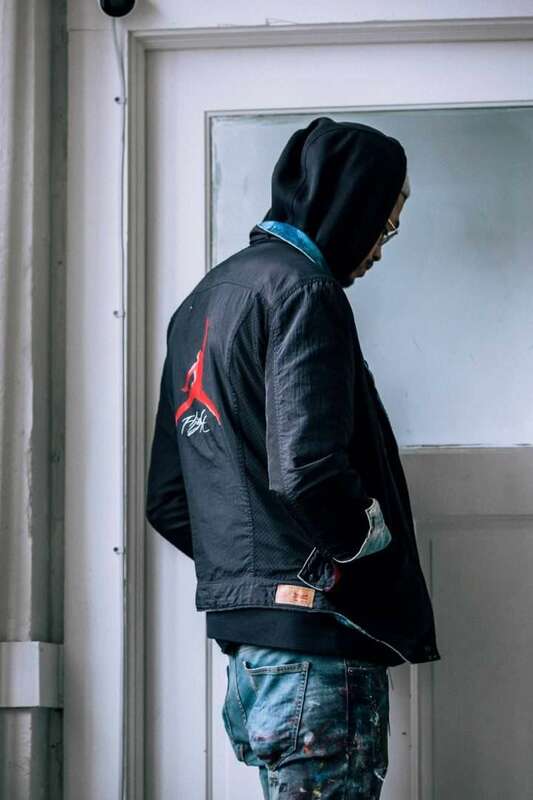 How does this Jordan x Levi’s® collaboration gel for you? I think the brands go hand-in-hand. 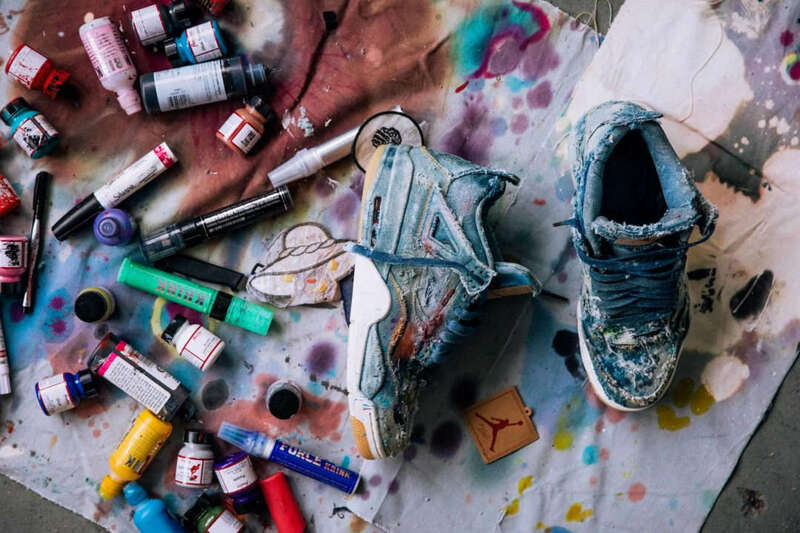 Jordan and Levi’s® are a staple for a whole lot of people. Denim has the ability to tell a story that words can’t and people will pick Levi’s® over any other denim regardless. It’s the same way with Jordan. I don’t care what any other brand is doing, I’m wearing Nikes and Jordan. 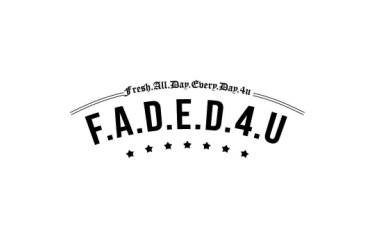 That’s a legacy, a level of brand loyalty that’s been established amongst the community and has amassed a monumental following.